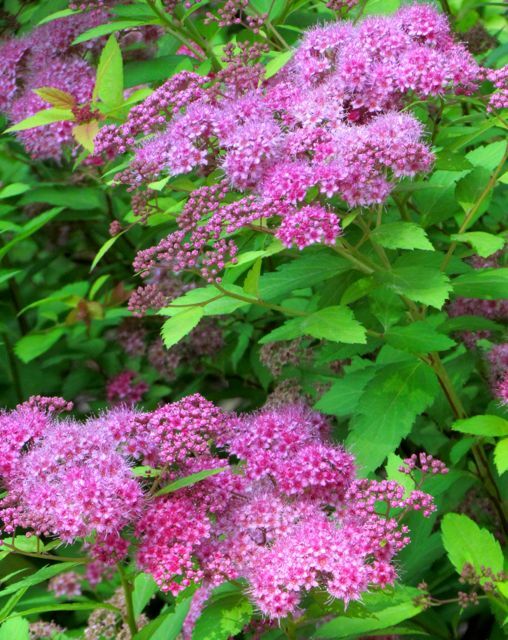 Spirea bumalda ‘Magic Carpet’ is not native, but this petite ornamental shrub also isn’t invasive. Its four-season pizzazz has earned it a permanent home in my landscape. The local nursery I purchased it from describes its mature size as 3 feet x 3 feet, and they were half right in my garden. I admit that many plants tend to exceed the maximum sizes described in catalogs and the literature, and no, I don’t fertilize them obsessively. In fact, only vegetables receive fertilizer in my yard. I’m blessed with fabulously fertile soil, and I pay careful attention to where I locate plants. My reward is their enthusiastic growth, which I’ve come to expect and plan for. In my garden, Magic Carpet never gets taller than three feet, but I think it has “carpet” in its name because of its tendency to branch low to the ground, and those low-growing branches root. Mature specimens in my yard consist of the mother shrub in the center, with little shrublets reaching out in all directions from that center. The low-growing branches insinuate themselves into any empty spaces between plants, creating a lush feel to any planting group they’re part of. When they spread a bit too enthusiastically, it’s easy to pull up the shallow-rooted shrublets. Of course, I have a hard time throwing away perfectly good plants, so this shrub now adds its chartruese-leaved light to many spots in my yard. I’ve also given away plenty of rooted shrublets to friends. It’s just too pretty to compost. How pretty? In winter, the dark, thin branches twist into aesthetic tangles — fabulous when covered by snow. Spring brings a burst of new leaves sporting a red tinge that transform to the chartreuse you see in the photo. Those leaves are followed by gazillions of pink flower clusters — pink powder puffs that attract many pollinators. Butterflies will stop by, but the flowers are most beloved by true bumblebees (not the giant carpenter bees). They bumble all over the pink clusters from dawn to dusk, and they’re so fixated on their task that they barely complain if I bump into a shrub on the way to refilling the bird bath. Here’s a close-up of the flowers. Note the color of the new leaves in the top left corner of the photo. 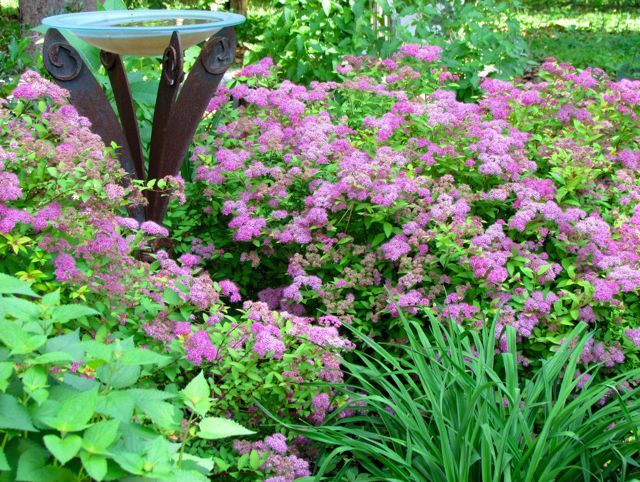 Throughout the summer, smaller flushes of blooms occur as the shrub continues to produce new growth. Then, just when you think this shrub can’t be more gorgeous, autumn brings a color transformation to the leaves. Suddenly, they go deep crimson, and the leaves linger on the branches until the weather turns bitterly cold — usually December in my garden. I don’t think you can ask for more four-season beauty than this little ornamental shrub offers. It can tolerate full sun to partial shade, and the chartreuse leaves really do brighten up dark spots in the landscape. If you’ve got a spot in your Piedmont garden that needs a touch of pizzazz, consider Magic Carpet. You won’t be disappointed. This entry was posted on May 28, 2011, 5:12 pm and is filed under Favorite Plants, piedmont gardening. You can follow any responses to this entry through RSS 2.0. You can leave a response, or trackback from your own site.